If there is one thing that gives DIY enthusiasts and professionals alike a hard time, then it must be choosing the right tool for the right job. The numerous options from manufacturers as well as brand names do not make the choices any easier. Then there is also the likelihood that products from popular brands do not make the cut for you. They may be expensive, but that does not always guarantee quality and performance superiority. 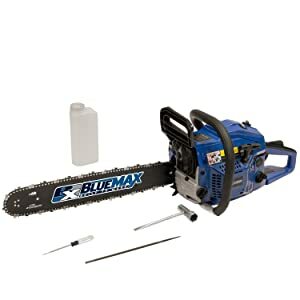 One of the brands that are beginning to attract attention is the Blue Max Chainsaw. Often found in many power tool stores, they have an array of unique features besides the standout blue color. This tool is possibly not well known in the chainsaw world hence the curiosity surrounding it. Who makes it? How powerful is it? What are some of its features? Why should one choose it? What are the options of tools available from the same manufacturer? These are some of the questions that you might be having regarding this product. We will try to answer all these questions in this Blue Max Chainsaw guide. 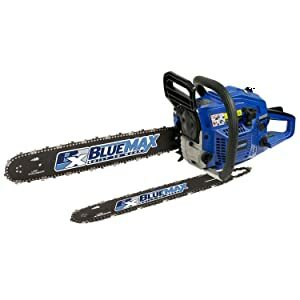 Who Makes Blue Max Chainsaw? Blue Max Chainsaws are a brand of power saw tools made by a company called North America Tool Industries (NATI). Other brands made by the same company include the Professional Woodworker, Egergin, Yard Dog, and Speedway. The company partners with other manufacturers such as Sears, Home Depot, and OverStock to make power tools designated for DIY enthusiasts. These tools are marketed as high quality (I have not used very many of them personally). According to the Manufacturer’s website, they have been making and distributing the Blue Max Chainsaws for about 50 years now. Surprisingly, it is only in the past couple of years that this chainsaw is actually making its presence felt. The manufacturer claims that the product could be best used for professional wood cutting needs. However, that should not freeze out DIY enthusiasts and homeowners. The available information indicates that the company is located somewhere in Indiana. When I took a quick peek at the website, I stumbled upon some little information that they also provide logistics services, just as they manufacture automotive, construction and farm equipment. The website itself is generic and does not provide clear information to anyone who visits it. If you go through it keenly, you will realize that there is no mention as to whether they make this chainsaw by themselves. The 50 years of operation is also in doubt. To give you a broader perspective on the chainsaws produced by NATI, we will review two of the models made by them. We hope this will help you get a clear picture of the features and how you can expect them to perform if you buy one. The Blue Max 8901 is a 2 in 1 chainsaw. Perhaps you are asking how but this model comes with two different bars and chains. It features both 20” and 14” bar and chains which is great. This is because it is like owning two chainsaws. A 45cc, 2-stroke, single cylinder gas engine produces the needed power to drive both chain lengths. On load, the engine drives the chain at speeds of up to 2800 revolutions per minute. Since it is a 2-cycle engine, it requires a fuel oil mixture in the ratio of 40:1. For chain tensioning, a pro-tensioner that is easily accessible is provided. You can use this to quickly make adjustments in the chain tension for chain durability. Another great feature you could love is the anti-vibration technology in the handle to reduce operator fatigue. A Quick-Start Capacitor Discharge Ignition (CDI) ignition system provides a quick way of getting the chainsaw up and running. The manufacturer also claims that this chainsaw comprises of 30 percent more teeth in order to reduce cutting time. The Blue Max 6595 is another great chainsaw option from NATI that you could have into consideration. It is powered by a 45cc, 2-stroke single cylinder Gas Engine. It seems it is the same engine that powers the 8901 that’s mounted onto this one too. This engine is capable of delivering no load chain speeds of up to 2,800 Revolutions Per Minute (RPM). The power generated by the engine is then transmitted through the drive train to the 18-inch bar and chain. The resulting drive speeds are great if you want a reduced cutting time. Capacitor Discharge Ignition (CDI) provides for a reduced start time in most weather conditions. In addition, an ergonomically designed handle has anti-vibration padding to lower the vibrations as much as possible. This is good for eliminating fatigue during use. An inertia activated safety feature quickly brings the chain to a stop when the chainsaw is switched off. This feature keeps you safe from any accidental chain kickbacks. What’s more, an auto oiler automatically lubricates the bar as long as the engine is running and there is oil in the reservoir. 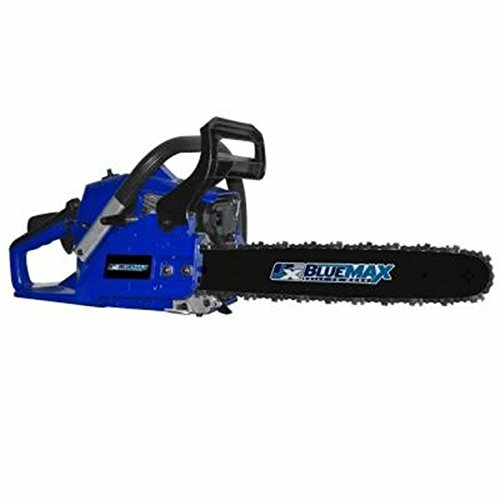 Why Should You Choose A Blue Max Chainsaw? Chances are that you usually buy a particular chainsaw simply because it is more affordable in comparison to the other available brands. It is a strategy that has worked for many who want a chainsaw for their occasional usage. In fact, this is the main reason why most users by the Blue Max Chainsaw. As the reviews of the two products (the 8901 and the 6595) show, they are well suited for homeowners. These two meet the criteria of low usage and tight budgets making them your ideal choices. By matching affordability with performance, buyers are provided with a win-win situation. Some of the features even match those provided by the expensive brands such as Husqvarna. However, there is still an evident difference in terms of quality. For those occasional uses, the Blue Max Chainsaws are great alternatives. When constantly used, various mechanical issues start to impede their performance. Of the two products, it is the 8901 that is most popular. Its 2 in 1 capabilities coupled with the fact that it with costs affordable makes it a good chainsaw for homeowners. Buying it is like owning two chainsaws, one with a 14” bar and the other with a 20” bar. It gets decent reviews from those who say it works great and starts without any fuss. You can use it to cut relatively thick trees and firewood without any issues. Just like the other Blue Max brands, it has features in place to keep you safe from vibrations and kickbacks. So, if you want a low-cost chainsaw for your not so frequent uses, then Blue Max could be a great choice for you. After a period of usage, you will need to find replacement chain guide bar. Some of the reviews state that finding the spares for these chainsaws is hard, but I think you can still find one from Blue Max that stands the test of time. These bars are of very high quality, heavy duty, rust resistant and work great in any weather. The lubrication system of the guide bars is an automated one so that it reduces friction automatically. In turn, the lifespan of the bars is increased. If you are looking for the specific Blue Max Chainsaw chain bar, then you can find one from Amazon, Sears, Home Depot and any other online retail platform that you trust. But if you want just the bar regardless of the brand, then you can still find plenty of available options. Any chainsaw chain gets worn out after a series of wood cutting sessions. In some cases, these chains also get broken or damaged hence the need for replacement. The good news is that you can find the exact Blue Max Chainsaw chain as a replacement. These chains are from the manufacturer of the tool and offer you good durability. The chains are fitted with additional teeth to cut down on cutting time. They are also easy to clean and last considerably longer. The most cost-effective options can be found in stores such as Sears and Home Depot. But if you want to buy from an online retailer, then you can find one at Amazon. When it comes to buying the chain, you can either buy the chainsaw brand one or buy any other chain provided the length and pitch match those of the guide bar. The Blue Max Chainsaws are relatively unknown. However, of late these tools have been making inroads into the market thanks to their affordability. Regardless of this, opinions and reviews are still divided as to whether they are really that effective. Do not buy one if you need to do a huge volume of heavy duty cutting as it might fail you. If you keep the usage low, then it will benefit you a great deal. Before you buy one, I would implore you to check all the reviews and see what prior buyers are saying about the product. You can then learn from their mistakes and successes before making the most informed decision. If it comes down to making a choice, I would go for the Blue Max 8901 Combination Chainsaw. It is the most popular of the Blue Maxi brand as well as being versatile. It also gives the user a better performance, although not as you would wish for.